Meijer: Frozen veg for $0.30 each!!! 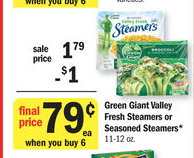 This week Green Giant Vegetables are part of the buy 6, save $6 instantly sale! Buy (2) Any items included in the buy 6, save $6 sale! Final Cost: $0.30 each wyb4!!! <<STOCK UP PRICE! !